Is “America” an Indigenous word? Mexika.org is proud to present a series of articles which serve to articulate the goals and positions of Yankwik Mexikayotl. Please subscribe to our site for more. In 1958, Edmundo O’Gorman—one of Mexico’s most notable modern historians—published his seminal book, La invención de América: investigación acerba de la estructura histórica del nuevo mundo y del sentido de su devenir, which looked at the idea of America vis-à-vis the European imaginary of the so-called “New World.” His book turned out to be so influential that it was translated into English a few years later. Since then, the book has gone through four Spanish editions, numerous English ones, and has been translated into several languages, including French. These simple facts underscore the importance of his work. I was first exposed to him, not in college or graduate school, but by accident as I scanned the history shelves of a used book store in Houston about ten years ago. Back then, I was only a part-time community college student who’d just begun what turned out to be a long academic career. At that stage in my life, I’d been in the tradición (danza azteca and Mexikayotl) for about five years, and O’Gorman’s book, La invención, really struck a chord with me. Besides the fact that I liked his contrarian approach to historical convention, not the least because I’m a natural contrarian myself, it also played into one of the major tenets of Mexikayotl—that of rejecting Eurocentric historical interpretations. It didn’t take long for me to use O’Gorman’s work to support my case whenever I discussed the “falsity” of using the toponym America instead of the various indigenous names like Turtle Island, Abya Yala, and, of course, Ixachilan. One of O’Gorman’s major arguments is that Europeans constructed an image of the Americas that fit whatever happened to fancy their imagination. These included fantastical ideas about strange creatures (both animal and human), Amazon women, St. Thomas as Quetzalcoatl, and the existence of a terrestrial paradise—heaven on earth, the Garden of Eden. Americanist scholars take this analytical framework for granted now, but it took O’Gorman to point his out. In this and other analytical frameworks, he was a pioneer, and his book is still referenced by scholars interested in the history of ideas, especially those looking at the legacy of Spanish invasion and colonialism. I bring him up to show that the subject of “America”—its name, quality, and meaning—is not a foregone conclusion among scholars and thinkers. America! The land and name have provoked a centuries-long debate and conversation over who gets credit for discovering it and who gets the honor of having it named after them. Whatever your thoughts on the matter, convention has it that the American continents are named after Amerigo Vespucci. This is an entrenched idea that no one really seriously questions except for a select few, such as nationalists—from both the Hispanosphere and certain anti-German Europeans, and the more radical individuals from within indigene-centric circles. The key question is, why; why challenge the name given to the Western Hemisphere? For our purposes, I’m interested in getting to the source of this skepticism which has influenced modern Mexika/indigenist discourse. To begin with, my first encounter with the idea that there was a problem with the term “America” came in the form of its supposed Nahuatl name, “Ixachilan.” That topic deserves its own paper, for now let’s just note that the person responsible for popularizing the term Ixachilan was an early post-revolutionary Mexicanist, Juan Luna Cárdenas, who also subscribed to the notion that America was not named after the European explorer. In all fairness, I have no problem with the usage of the term “Ixachilan” or that the name “America” is questioned. My problem is that ideas like these were presented to me as indisputable facts when I was first being instructed in the ways of the tradición, the “Red Road.” My teachers simply regurgitated what they’d learned and dutifully parroted and passed along unverified information as supposed “ancient knowledge” to unsuspecting neophytes like myself. This “ancient knowledge” was relayed to me as truth with origins in remote antiquity, and I was expected to take it on faith that things were as they’d been suggested to me. In other words, I was religiously indoctrinated. Setting aside my contrarian nature and penchant for skepticism, I wanted to believe that the imparted knowledge was factual and ancient. Little did I realize how naïve I’d been until I began to question everything, an undertaking that soon led to my inquiry into the provenance of the term Ixachilan. But, I’m not here to testify about my experience, I only offer it for context and to anticipate criticism from those who might wonder who I am and why I dare question the tenets of Mexikayotl. To be clear, I’ve been involved in one way or another in the tradición for over fifteen years, and I decided a few years ago that—in order to be honest with myself, my family, and newcomers—I would no longer be an apologist covering up for the falsehoods and contradictions propagated by many charlatans in our Mexika communities. My stance is that decrees and arguments from authority should be taken cautiously especially when revealed without (solid) evidence or a means of falsifiability. These include pronouncements made from authoritative figures that many hold close and dear; they’re just as human as you and I, and their age, asceticism, and sincerity does not equate to infallibility. Some people believe that America as a name stems from the mountain range known as Amerique located in Nicaragua. Others believe that it stems from a word common to several American languages of the Caribbean and South America, namely Maraca (pronounced maracá, maráca, and mbaraca). This word, meaning rattle or gourd, is found as a place name in Venezuela (Maracapana, Maracay, Maracaibo), Trinidad (Maracas), Puerto Rico (Maracayu, etc. ), Brazil (Maraca, Itamaraca) and elsewhere. Many very early maps of the Caribbean region show an island located to the northwest of Venezuela (where Nicaragua is actually located) called “tamaraque” which has been interpreted as t. amaraque standing for tierra or terra (land) of Amaraque. All of this is before America first appeared as a name on the mainland roughly in the area of Venezuela. Most of us have probably been taught that America as a name is derived from that of Amerigo Vespucci, a notorious liar and enslaver of Native people. Strangely enough, Vespucci’s first name is more often recorded as Albérico rather than Amerigo. It may well be that the name America is not derived from his name, but we know for sure that it was first applied to South America or Central America and not to the area of the United States. In the undated column post entitled, “What Do We Mean by America and American,” Forbes basically repeats verbatim from his 1995 article. It’s hard to say whether indigene-centrists who subscribe to the hypothesis got it from Forbes, but it’s probably safe to say, that given Forbes’s influence, he must have impressed some Mexika who later disseminated that view. Well yes, the name America rarely appears in the books and its origin is certainly not explained in the geographical maps, but is attributed to a certain man named Amerigo Vespucci. In fact, there never was an Amerigo Vespucci, because his real name was Albericus Vespucci, making several trips with Christopher Columbus, specifically on his second voyage when the region of Venezuela was seen. He asked the natives where they were from, and they replied that they were from the mountains of “Amerrica” which ​​are to the west of the country. Subsequently, he sent his relaciones [written accounts] to Germany to a gentleman named Waldseemüller who read the wonders of the trip. As a result, Waldseemüller chose to immortalize the surname of the cartographer and navigator, who was a very learned man, by using “Americae Vespucci” with a Latin ending [for America, “ae”] which means “of,” and meant “America of Vespucci.” Later, people who ignored Latin took away the “ae,” which is the genitive ending of the first Latin translation, and changed it to an “o” making it “Américo;” but certainly it is so that the western Venezuelan mountain region “Amerrica” ​​ was used to give the name to the entire continent. Which by the way, in the Aztec language it [the continent] already had another name called “Ixachílan,” where this ethnic group traveled from the regions of Canada to the pre-Inca Andes, and vice-versa, from the pre-Inca Andes and Mesoamerica they traveled north to visit the Aztec groups of North America. As we can see, there are a few things that Luna Cárdenas and Forbes agree on: that the Western Hemisphere is named after a mountain region whose name is the indigenous source for the term “America;” that the direction and location of the mountain range is somewhere west to northwest of modern day Venezuela; and that Amerigo Vespucci’s “real” name is recorded as Albérico, or Albericus. The issue surrounding Vespucci’s first name could easily be resolved by conducting a sort of historiography of the name Amerigo to trace its frequency in the historical record in relation to the proposed alternative of Albérico. Perhaps an ambitious individual with time and interest will take this task on. On the other hand, searching for the link between the toponym America and its supposed aboriginal variants resulted in exciting, but conflicting, results! At first, the references found in Forbes’s article, like “tamaraque” and “t. amaraque,” didn’t lead anywhere, and standard search engine queries resulted in a single source pointing to the Latin word “amaraque” which means a “cask” or “jar” (as in wine), but nothing regarding its purported connection to the term America. It then occurred to me that perhaps I’d have better luck sifting through the maps of the Exploration Age for any evidence for the toponymical variants mentioned by of Forbes. 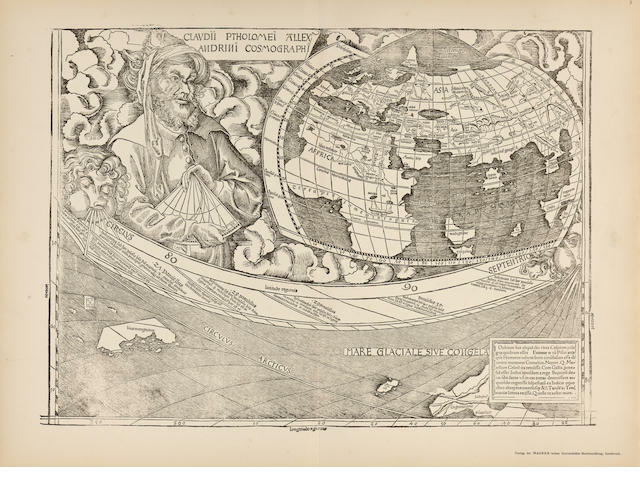 A search of the available maps online from universities, institutions, and the Library of Congress didn’t yield any helpful results and neither did Martin Waldseemüller’s map (1507). It was also very difficult to locate any pre-Waldseemüller maps that, according to Forbes, are the source for the name variants. After this unfruitful search, I turned to Google Maps in hopes that perhaps a residual place name still survived in or near Venezuela. Other than the names Forbes lists, like Maracay and Maracaibo, there wasn’t anything substantive there. I then turned my gaze towards Nicaragua to find a delightful surprise; as it turns out, there is in fact a mountain range that is still called Serranías de Amerrisque, or Cordillera de Amerrisque (Amerrisque Mountains) near Chontales, Nicaragua! Undoubtedly, this is the mountain range that Luna Cárdenas incorrectly placed in Venezuela. Basically, Belt is drawing a connection between the Lenca of Honduras with the pre-Nahua culture that inhabited that part of Nicaragua based on linguistic place-name similarities. Here, Belt establishes that Amerrisque, or Amerrique, was an ancient name predating even the Aztec invasion of Nicaragua, although I’m not entirely sure if his assessment is correct. The next mention of Amerrique comes from Jules Marcou, a Swiss geologist, who first suggested the “American toponym hypothesis” (ATH) in connection with the Amerrique Mountains in an essay entitled, “Sur L’origine Du Nom d’Amérique” (1875). Apparently, when Columbus landed on the coast of Nicaragua (and not Costa Rica as most historians claim) he was met by indigenous people adorned in gold ornaments, who when asked about its source responded, “Amerrique.” Historically, the “Sierra Amerique was a major source of precious metal, not only to the Native population, but to later Spanish colonists” as well. Marcou had learned about the Amerrique Mountains from Thomas Belt’s book, and it struck him that the names of the Western Hemisphere and the Nicaraguan mountain range were remarkably similar. As one would expect, his hypothesis received mixed reviews, of which the most critical ones predictably came from Italian and German scholars and the English speaking world. 2. Vespucci’s name is Alberico in Italian and Spanish, and Albericus in Latin. I won’t go into the specifics of Marcou’s argument, but anyone seriously interested in knowing more about this topic should read his book. Just to list a few pertinent points, he thought that Alexander von Humboldt made the mistake of giving too much credit to Waldseemüller, and that Europeans supposedly associated the term Amerrique with gold, thus, making the land and the coveted metal synonymous. That argument might help explain why the name America became affixed to the so-called “New World,” but the best Marcou offers are speculations and nothing concrete enough to soundly refute the convention. The same year that Marcou published Nouvelles recherchés, Thomas H. de Lambert de St. Bris published the Discovery of the Origin of the Name of America (1888), which argued that America was derived from “Amaraca-pana,” a place that was located in Venezuela. And although Marcou was the first to really explore the notion that the term America had indigenous origins, St. Bris—going by his shortened name, T. H. Lambert—published an article in 1883 that influenced Marcou’s Nouvelles recherché, and vice-versa. In fact, there’s so much overlap between the two that at times it’s hard to determine who is borrowing from whom. What is certain is that they both agreed that America was an indigenous derived term that had been misappropriated and misapplied to Vespucci; but, in order to appreciate their argument, we should examine some of their evidence. The main problem with this story concerns the toponym “Amarca;” neither it, nor the supposed name change of Utatlan, is found in the Popol Vuh or any of the pertinent literature. At best, “Amarca” is a shortened version of Cundinamarca, a department of what was then the political entity of Gran Colombia which used to encompass all or part of the following modern countries prior to 1824: Brazil, Colombia, Ecuador, Guyana, Panama, Peru, and Venezuela. It is now relegated to a small section in central Columbia and includes that country’s capital city of Bogotá. There’s no reason to accept Lambert’s (St. Bris) explanation above, especially considering that the name Cundinamarca “comes from kundur marqa, an indigenous expression, probably derived from Chibcha. Meaning ‘condor’s nest,’ it was used in pre-Columbian times by the natives of the Magdalena Valley to refer to the nearby highlands.” Furthermore, the etymology of the name Peru is not “eru” with an added “p;” it is derived from “Birú, the name of a local ruler who lived near the Bay of San Miguel, Panama, in the early 16th century.” But I don’t blame Lambert for trying. Interestingly, Lambert (St. Bris) appears to have gotten his “Amarca” reference from an even earlier book by a French scholar named Charles Hippolyte Paravey who posed the question in his book, Mémoire sur l’origine japonaise, arabe et basque de la civilisation des peuples du plateau de Bogota (1835): “It would be interesting to examine whether all these American names like Amarca, Amerga, as well as that of Amerigo Vespucci, were not the cause of the name given to the new continent, America or Amarca.” Paravey appears to have taken the names “Amarca,” “Cundin-Amarca,” and their relative “Caj-amarca” from Alexander von Humboldt, and is perhaps the first scholar to see a possible connection between these indigenous place-names and that of America. Unfortunately, he doesn’t cite his work and there is no bibliography either, so I have to guess that it comes from Humboldt’s Monographia Melastomacearum (1816) which deals with Peru and surrounding areas. Humboldt wrote many books on the Americas, and there are possibly numerous references to these places throughout his works. The point of land, so like an isle, and now known as Maraca-aibo, was no doubt part of Amaraca-pana, mentioned by Humboldt, and it is a curious illustration of these early errors, to find it called by Ojeda, the isle, province, and lake of Coquivacoa—which the crown appointed him governor of, though existing only in his imagination; but they soon found out their mistake, for the name Coqui, meant Chibchi—the Chibchi royal race of the Kingdom of Cundin-Amaraca … Chibchi … was the name of the people, and not their country; and altered it to Maraca-ibo, which like Maraca pana, meant Amaraca or America. The problem is that the supposed work by Humboldt that St. Bris cites, “Relation Historiques, Vol II, pg. 462,” is apparently nonexistent! A search in the usual databases did not return any book of that name that is attributed to Humboldt. All references lead back to St. Bris’s book, Discovery, which is as shame, because it would be great to know whether or not Humboldt is the main source used in the ATH and all of its variants. At this point, this is getting a bit redundant, but, if you’ve made it down this far, congratulations! You are a history geek, just like me. No worries, though, I won’t torture you anymore with this pedantic exercise and bring it to a conclusion. Throughout the remainder of the nineteenth- century, several writers followed St. Bris and either critiqued or echoed his sentiments, but nothing new worth mentioning. This continued up until the early 1910s, after which, the First World War seems to have preoccupied people’s minds, and this whole ATH mess was discarded—except for americanistas (mainly authors in the Hispanophone countries) like Juan Luna Cárdenas and the Nicaraguan archeologist, Jorge E. Estrada. Other than Jack D. Forbes, Anglophone America had virtually forgotten about this; so, why have I just spent time and effort researching and writing about this? Because, as recently as 2001, a handbook about the “Aztec Calendar” was published that includes the words “Amaraca” and “Amerrisque” in the glossary which repeat some of these unfounded claims. Then in 2002, a supposedly previously unpublished manuscript called, The Name of America (1911) by a certain Alexander del Mar, was included in an edited volume of essays. I suppose that the editor felt he should include this piece in his volume, simply because he found it at the New York Public Library and found the contents intriguing. Del Mar’s short sketch basically parrots Marcou and St. Bris without adding anything new or significant to the ATH. The basic timeline looks like this: in 1835, the French scholar Charles Hippolyte Paravey was the first person to call into question the provenance of the moniker America, casually mentioning that Alexander von Humboldt was his source; in 1874, the British geologist Thomas Belt made a reference to the Amerrique Mts. ; this was followed by the publication of two short papers, one from the Swiss geologist, Jules Marcou in 1875 and the other by Thomas Lambert de St. Bris in 1883—both later published longer treatises on the subject in 1888. All other treatments of the ATH that came later basically repeated, in one way or another, what Marcou and St. Bris initially stated. Nothing new has surfaced since then. Edmundo O’Gorman, La invención de América: investigación acerba de la estructura histórica del nuevo mundo y del sentido de su devenir (México: Fondo de cultura económica, 1958). Edmundo O’Gorman, The Invention of America: An Inquiry into the Historical Nature of the New World and the Meaning of Its History. (Bloomington: Indiana University Press, 1961). For more recent examples, see Enrique D. Dussel, The Invention of the Americas: Eclipse of “the Other” and the Myth of Modernity, trans. Michael D. Barber (New York: Continuum, 1995); and José Rabasa, Inventing America: Spanish Historiography and the Formation of Eurocentrism (Norman: University of Oklahoma Press, 1993). The term “radical” here is not meant to disparage, but rather as a signifier of that which is “rooted” in the quality being described. Indoctrination is a huge problem in Mexikayotl that needs to be addressed, but that topic merits its own essay. For an introduction into the philosophy of the scientific method and “falsifiability” see Karl R. Popper, The Logic of Scientific Discovery (London: Hutchinson, 1959). Jack D. Forbes was an acclaimed historian of Native background known in Mexika circles for his seminal book, Aztecas Del Norte: The Chicanos of Aztlán (Greenwich, Conn.: Fawcett Publications, 1973). The column is no longer available. It appears to have been taken down after he passed away in 2011. You can still find some of his old column posts on many indigene-centric websites. Jack D. Forbes, “The Use of Racial and Ethnic Terms in America: Management by Manipulation,” Wicazo Sa Review 11, no. 2 (October 1, 1995): 53. This is incorrect. Vespucci sailed with Portuguese explorers, and never with Columbus. Original in Spanish; translation and transcription is my own. League of United Latin American Citizens, Cultura y civilización azteca / Juan Luna Cárdenas, DVD (from original U-matic videocassette container), Filmed Interviews, Special Collections, Benson Latin American Collection, UT-Austin, (1979), 00:28-02:51. For the Latin definitions see Gregson Davis, “Wine and the Symposium,” in The Cambridge Companion to Horace (United Kingdom: Cambridge University Press, 2007), 211–12. “Amerrisque Mountains,” Wikipedia, the Free Encyclopedia, May 27, 2014, http://en.wikipedia.org/w/index.php?title=Amerrisque_Mountains&oldid=610301006. Thomas Belt, The Naturalist in Nicaragua: A Narrative of a Residence at the Gold Mines of Chontales; Journeys in the Savannahs and Forests. With Observations on Animals and Plants in Reference to the Theory of Evolution of Living Forms (London: Bradbury, Agnew, & Co., 1874), 155. Jules Marcou, “Sur L’origine Du Nom d’Amérique,” Extrait Du Bulletin de La Société de Géographie, June 1875. The archeologist Jorge E. Estrada successfully argued that Columbus’ landfall on his fourth voyage was located in Nicaragua, and not Costa Rica in his work, Nicaragua: cuna de América (Managua: Ed. Alemana, 1969). This claim was first made by Jules Marcou (see previous citation). Charles F. Gritzner, Nicaragua (New York: Infobase Publishing, 2010), 35–36. My translation from the Spanish edition. Italics in the original. Jules Marcou, Nuevas investigaciones sobre el origen del nombre América, trans. J. D. Rodríguez (Managua: Tipografía nacional, 1888), 4. Italics mine. T. H. Lambert, “The Origin of the Name of America: From the National History of the Peruvians,” Journal of the American Geographical Society of New York 15 (January 1, 1883): 55–56. “Cundinamarca Department,” Wikipedia, the Free Encyclopedia, April 8, 2015, https://en.wikipedia.org/w/index.php?title=Cundinamarca_Department&oldid=655543018. “Peru,” Wikipedia, the Free Encyclopedia, April 19, 2015, https://en.wikipedia.org/w/index.php?title=Peru&oldid=657250212. Since I’m not a specialist on South American cultures, I’ll accept the dictionary definitions, but I’m open to suggestions and/or corrections. French original: “Il serait curieux de rechercher si tous ces noms américains en Amarca, Amerga, n’ont pas, aussi-bien que celui d’Amèric Vespuce, été la cause du nom donné au nouveau continent, America ou Amarca.” Charles Hippolyte de Paravey, Mémoire Sur L’origine Japonaise,arabe et Basque de La Civilisation Des Peuples Du Plateau de Bogota, D’après Les Travaux Récens de MM. de Humboldt et Siébold (Paris: Epernay: Impr. de Warin-Thierry et fils, 1835), 21, see footnote. Alexander von Humboldt, Monographia Melastomacearum: Continens Plantas Huius Ordinis, Hucusque Collectas, Praesertim per Regnum Mexici, in Provinciis Caracarum et Novae Andalusiae, in Peruvianorum, Quitensium, Novae Granatae Andibus, Ad Orinoci, Fluvii Nigri, Fluminis Amazonum Rupas Nascentes (Paris: A la Libraire Grecque-Latin-Allemand, 1816), http://www.biodiversitylibrary.org/bibliography/16027. In a book that’s part of a multivolume published between 1836-39, Humboldt mentions the term “tamaraque,” but it doesn’t appear that he’s trying to connect it to America. Alexander von Humboldt, Histoire de la géographie du nouveau continent et des progrès de l’astronomie nautique aux XVe et XVIe siècles comprenant l’histoire de la découverte de l’Amérique (Paris: Legrand, Pomey et Crouzet, 1839), 6, http://hdl.handle.net/2027/uc1.b3151618. Thomas H. de Lambert de St. Bris, Discovery of the Origin of the Name of America, abridged popular ed. (New York: S.N., 1888), 113. Randall C. Jiménez and Richard B. Graeber, The Aztec Calendar Handbook (Saratoga, CA: Historical Science Publishing, 2001), 73. Alexander Del Mar, “The Name of America,” in American Babel: Literatures of the United States from Abnaki to Zuni, ed. Marc Shell, Harvard English Studies 20 (Cambridge, Mass: Harvard University Press, 2002), 34–37.